Some bands made headlines. One band made history. 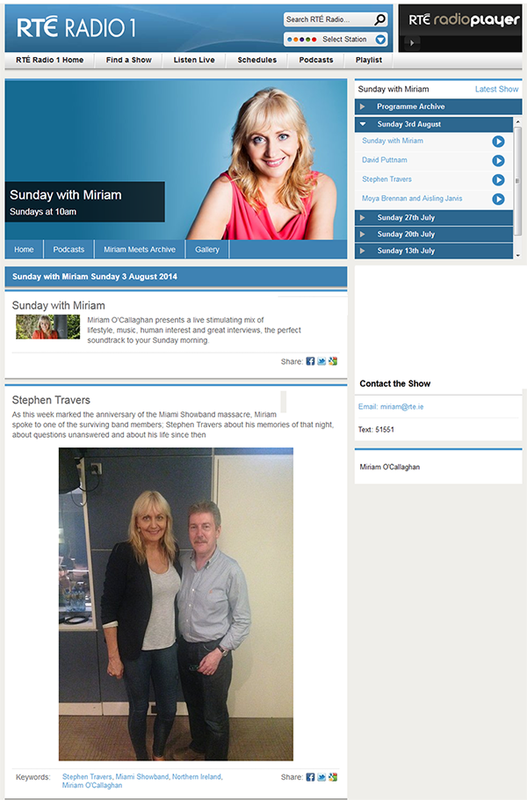 Miriam O’Callaghan presents a live stimulating mix of lifestyle, music, human interest and great interviews, the perfect soundtrack to your Sunday morning. David Puttnam – Oscar winning Producer and Director. Stephen Travers – As this week marked the anniversary of the Miami Showband massacre, Miriam spoke to one of the surviving band members; Stephen Travers about his memories of that night, about questions unanswered and about his life since then. Moya Brennan of Clannad and her daughter Aisling Jarvis were in studio to chat and perform. “Let’s make sure the world knows about it” – Stephen Travers. Enda McClafferty interviews Stephen Travers on Radio Foyle. Stephen: “Well. the evidence we see both from the HET and evidence we have unearthed ourselves is quite shocking and I suppose I can give you a taste of what to expect in our forthcoming legal action. Here’s an example of how British official policy deliberately colluded with terrorism and directly assisted in countless murders. In 1973 it was decided to expand the intelligence gathering role of the UDR. (Note: The Ulster Defence Regiment which was the largest regiment in the British Army) We have in our possession a document marked ‘SECRET – UK EYES’ which was copied to the highest ranking officials in Northern Ireland including the Secretary of State and dated April 17th 1974 and this was part of what it says, ‘I should stress that under these proposals the UDR’s collecting role will be directed at intelligence on terrorist activities. There is no intention of recruiting or encouraging members of the UDR to become informers on subversive elements within the UDR although as you know subversion in the UDR is a cause for concern. Both the GOC and Commander UDR would be strongly averse to any proposal to task members of the UDR in this way.’ Now, here we have the highest ranking officials clearly stating that should members of the UDR have knowledge of active terrorists within their ranks they are not to report them. 31st July 2013: Stephen Travers is interviewed on Good Morning Ulster about the issuance of the writ against the British Ministry Of Defence and Police Service of Northern Ireland in relation to the murder of members of The Miami Showband.